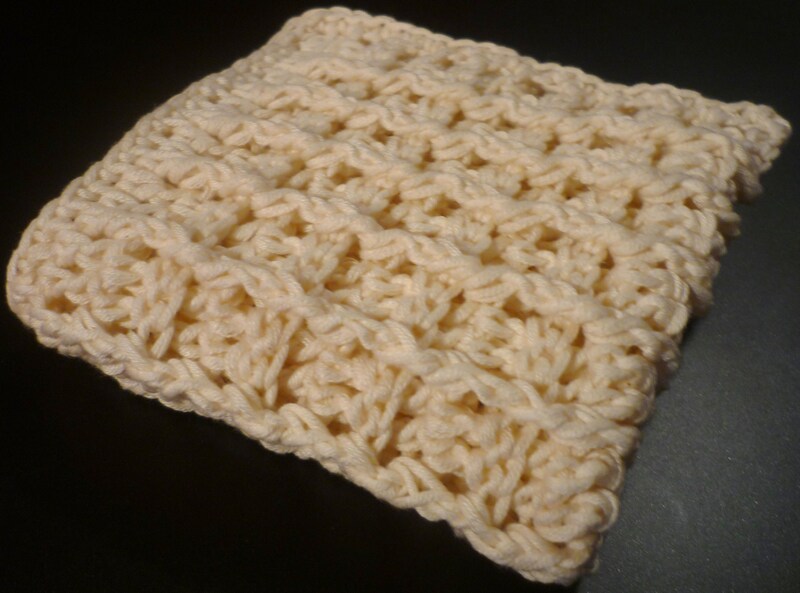 Here’s a pattern for a crocheted dish cloth that mainly uses double crochet. By working around the post of a double crochet in the row below, you can create a ridge, which is a handy scrubbing texture for dish cloths. FPdc: with crochet hook at front of piece, work dc around the post of dc in the row below. BPdc: with crochet hook at back of piece, work dc around the post of dc in the row below. Row 1: Dc in 4th ch from hook. Dc across. Ch 3 and turn. Row 2: [Ch 3 counts as first Dc in every row] **Dc in next 2 sts, BPdc in next dc. Repeat from ** across. End with dc in turning ch. Ch 3 and turn. Row 3: **BPdc in next 2 sts, FPdc in next st. Repeat from ** to last 3 sts. BPdc in next 2 sts. Dc in turning ch. Ch 3 and turn. Row 4: **Dc in next 2 sts, BPdc in next st. Repeat from ** across to last 3 sts. Dc in next 2 sts and in turning ch. Ch 3 and turn. Repeat last two rows until a total of 20 rows have been completed. Edging: work sc in each stitch around, working 2 sc into the side of each dc along side edges and working 3 sc into each corner. Fasten off. Weave in ends. Entry filed under: craft, crochet, free pattern. Tags: beginner crochet, BPdc, dish cloth, double crochet, easy crochet, FPdc, free pattern, ridged, scrubbing. Knitted Dish Cloth	Update! Update!